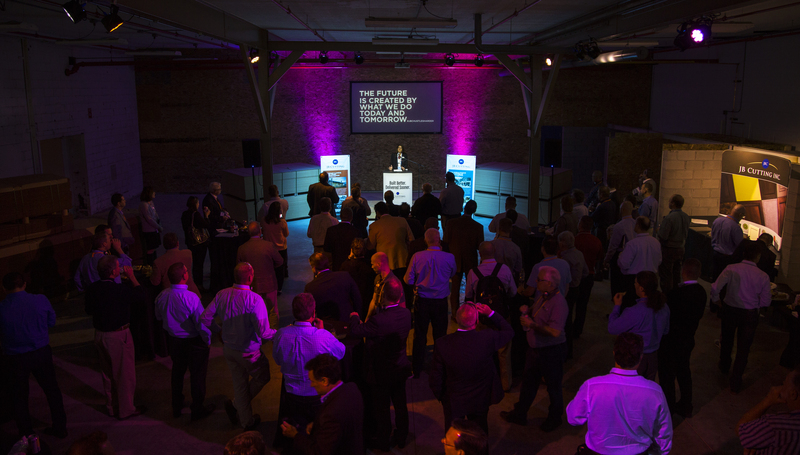 The theme of this year’s event “Rethink Manufacturing” was reinforced not only by the location, but in the briefings, speakers, case studies, and plant tours. 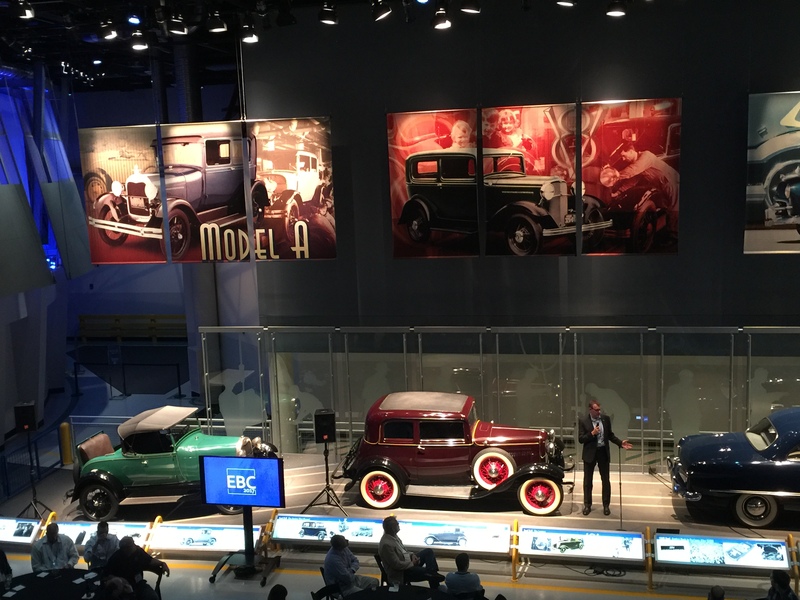 The three day conference kicked off Sunday with “An Introduction to Innovation” welcome reception and plant tour at the Ford River Rouge Facility in Dearborn, Michigan. 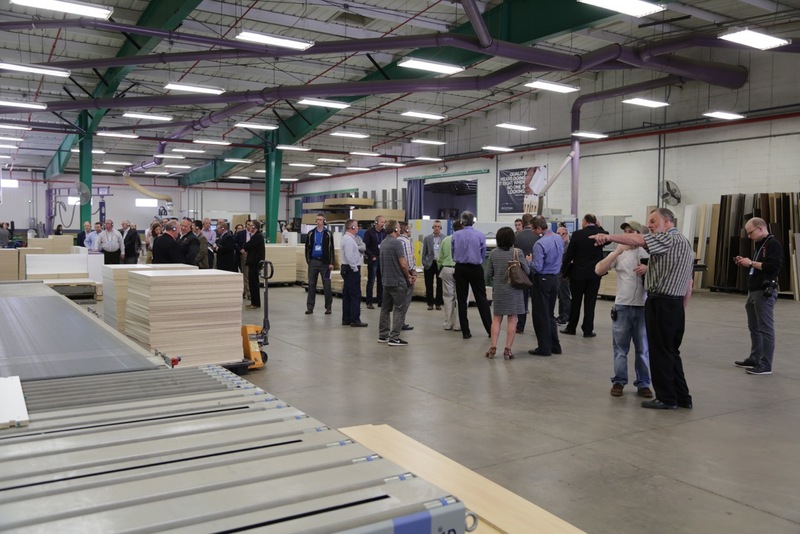 Attendees were given a warm welcome by Stiles’ President, Christian Vollmers, and then broken into groups to enjoy the four tour areas. Manufacturing Innovation Theatre – The all new Ford F-150 aluminum body truck is given the spotlight in this multisensory experience complete with wind gusts, robots, vibrating chairs and 3D renderings. Factory Walking Tour – The top attraction at the Rouge! Guests watch the F-150’s roll off the line, one truck per minute. Observation Deck – Guests were treated to a view of the 10.4 acre “Green Roof”. The roof collects and filters rainfall and cuts down on energy consumption in addition to being aesthetically pleasing. After a strolling dinner and networking, attendees returned to the Detroit Westin Book Cadillac hotel to gear up for the many informative events planned for Monday. For an in-depth look at innovation, pick up Josh’s latest book, Hacking Innovation: The New Growth Model from the Sinister World of Hackers. As the JB Cutting plant was one of the afternoon tours, we departed as the Keynote concluded to prepare for our guests. The conference continued with a briefing by Mario Bobsin of Fritz Egger GmbH & Co. on “Material Innovations for Maximizing Yields”. Following a break for refreshments, two tech briefings were presented: “Protecting Your Production Flow” by Richard Diller of StediWatt and “The New Language of Tooling” by Jurgen Koppel of Leitz Group. The feature presentation was given by Jennifer McNelly, President of 180Skills encompassing “Attracting Tomorrow’s Workforce”. The afternoon was dominated by two plant tours: JB Cutting and Fanuc America. Half of the attendees came to JBC and the other half toured Fanuc America, with the buses switching out groups mid-afternoon. 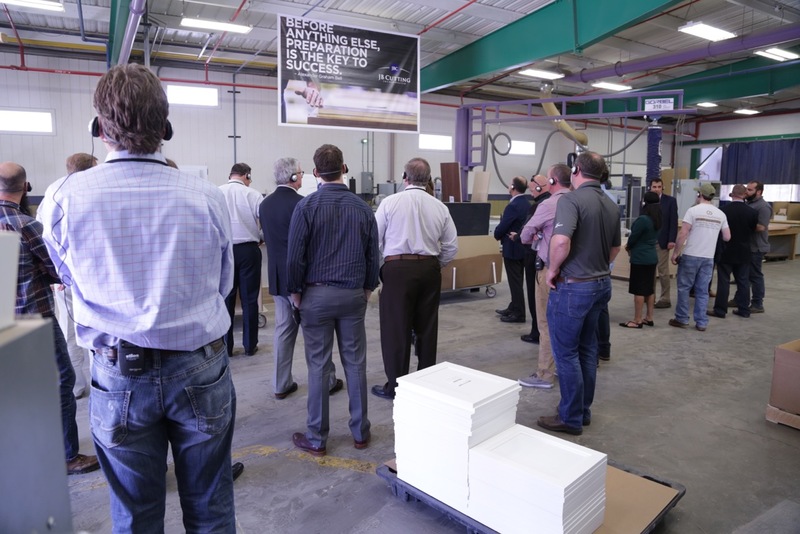 The focus of the Fanuc America tour was on their innovative robotic technologies and intelligent software related to woodworking. 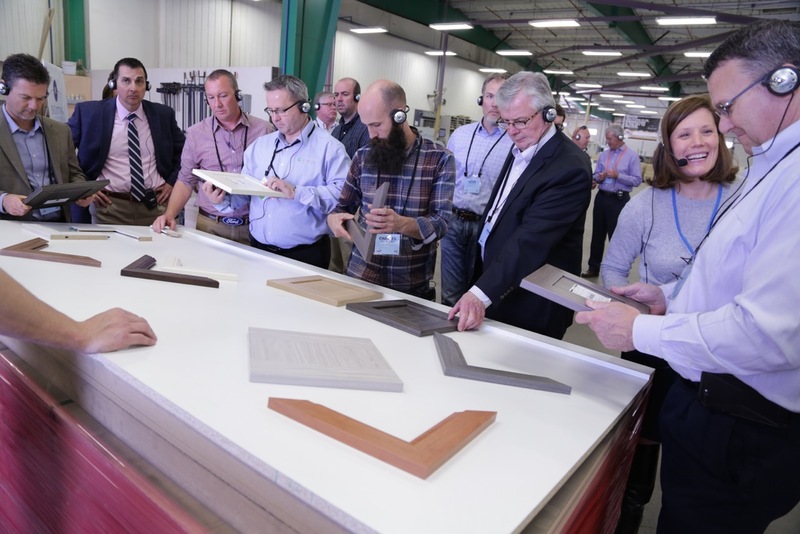 The JBC tour spotlighted our growth from a small cabinet shop in the early 70’s to one of the national leaders in thermofoil door and component manufacturing. The tour began in our future pressroom expansion area with a short speech by JBC President, Debra Behring. 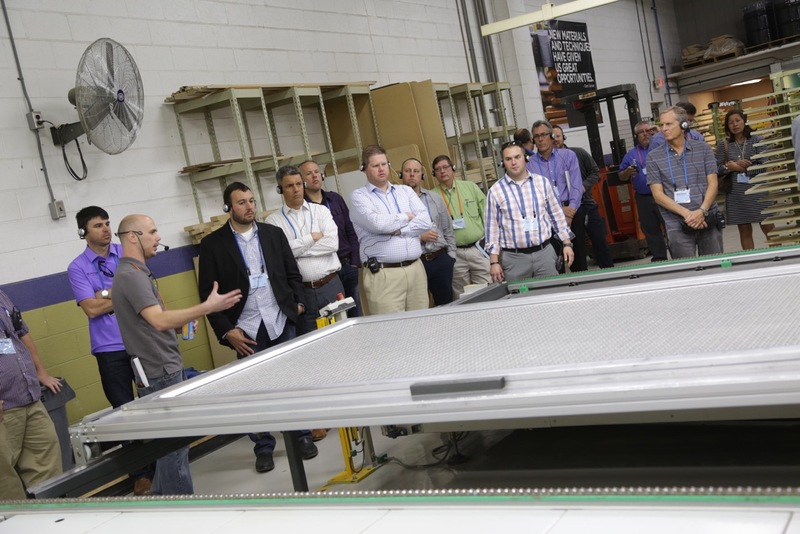 Visitors toured our CNC Router Cell, Pressroom Cell, Cabinet Component Cell and our 5 Piece Door Cell. Attendees were treated to a variety of Michigan-themed snacks including Better-Made Potato Chips, Homemade Cookies, assorted Faygo drinks and of course, a few Michigan Craft Beers! We are truly passionate about superior customer service, amazing quality, and innovation and hope that these passions came shining through, whether you checked out some of our products, talked to one of our employees, or looked at some pretty cool machinery. There were so many photos of the day, please visit the EBC page on our site to see them all! As the tours concluded, attendees were bused back to the Westin Book Cadillac Hotel, where dinner and networking were on the agenda. It was nice to be able to meet with people one-on-one, answer additional questions, and see what others are doing to re-think manufacturing. The final day, Tuesday, began with a networking breakfast. A panel discussion “Capitalizing on Your Digital Potential” followed. The panel consisted of Aaron Miller, Digital Marketing Director at Herman Miller, Denise Bahs, Social Media Strategist and Nick Schiffer, Owner of NS Builders (and Instagram Guru). They spoke at length about spreading brand awareness, driving customer response, and converting your followers to customers. Case studies, and a briefing by Gary Wernlund from Stiles lead up to the closing keynote speaker, Alan Beaulieu from ITR Economics. Alan is one of the most entertaining and engaging speakers we’ve ever heard! He makes economic forecasting fun and brought the EBC to a close with style and flair. The EBC is returning in 2019, in San Jose, California. We highly recommend attending; the EBC offers a forum to find out about new technologies and methods in a highly enjoyable way. Thank you to Stiles Machinery for allowing JBC to be a part of this meaningful event.